Spenco Medical Corporation expands global presence, joins high-end names on shelves in China. This global growth has allowed us to open a warehouse in China and ship products from the city Xiamen. We also have warehouses in Canada, Slovenia, Amsterdam and Waco, Texas, which positions us well for our worldwide growth goals. Canadian and Chinese consumers now have greater access to first-class insoles, supportive footwear and advanced first aid products. In a move signaling the company’s global growth, Spenco Medical Corporation acquired its Canadian distributor, Spenco Canada. Spenco products are also selling in China, where the company celebrated its first year with an exclusive distributor in one of the fastest-growing consumer goods nations. Spenco Canada now comes under the umbrella of the North American headquarters as a wholly owned subsidiary. Spenco plans on keeping its sales, customer service and shipping teams in place, and hiring a new national sales and marketing manager. In China, Spenco has operated for the last year under an exclusive distributor agreement with Teamwork, a sales and distribution company. 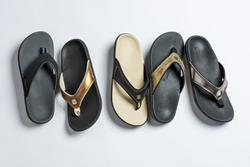 For the first time, Spenco's line of fashion-forward orthotic shoes, sandals and slippers are available at key Chinese retailers and select high-end shops. Spenco products are available in 87 countries, and can be found in many shoe stores, medical offices and on the Spenco website. Spenco, a leading producer of high quality insoles and foot care products, helps people everywhere achieve its motto of Love Your Feet®. Based in Waco, Texas, Spenco provides the most advanced sports medicine and first aid products available, as well as a line of premium shoes for men and women. Founded in 1967 by renowned foot care specialist Dr. Wayman Spence, Spenco earns consumer trust in its products by focusing on superior customer service to distinguish itself in the outdoor, sports, foot care and medical markets. Spenco Total Support® Insoles carry the American Podiatric Medical Association seal of acceptance. Learn more about Spenco products by visiting spenco.com or calling 800-877-3626. Spenco, a leading producer of high quality insoles and foot care products, helps people everywhere achieve its motto of Love Your Feet®.